What was the journey from Newgate prison to the gallows at Tyburn like for those condemned to death? This account is based on reading historical evidence. Monday and it was almost noon. 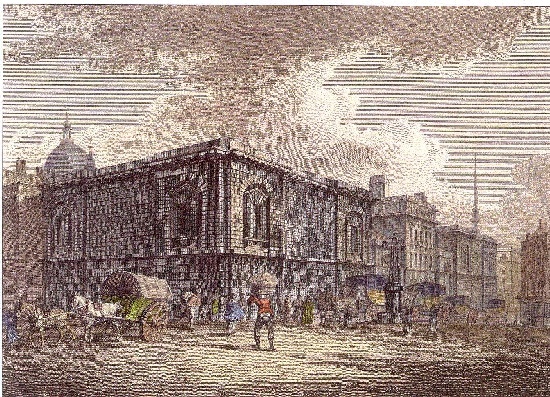 The prisoners were taken to the condemned room at Newgate prison to have their shackles removed and their hands tied, before being placed on the back of the horse-drawn cart that would take them on their final journey. They could hear the mourning bells of nearby St Sepulchre's church before they even left the prison. Some of them were dressed for the occasion - in wedding suits- and had their gallows speech ready. Others were concentrating on the words being spoken by the Ordinary (or clergyman) of Newgate and were too scared to speak; they still had a vivid picture in their mind of his Sunday night sermon to them and the black coffin that always stood next to him on those occasions. As the prison gate opened, they saw daylight. 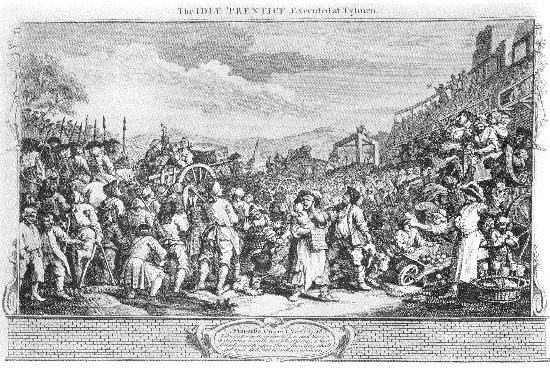 The two mile journey would take up to three hours because of the crowds: by the mid-eighteenth century London was probably the biggest city on earth with a population of almost three quarters of a million and thousands of them wanted to see the spectacle of a hanging. Whatever the delays, they only had a few hours to live - by four o'clock they would be dead, hanging on the three-cornered gallows at Tyburn. Outside the gates and all along the route there were people hanging out of windows of houses, all trying to catch a glimpse of the condemned. Girls were blowing kisses, people were throwing food, others were cheering or jeering and throwing excrement, but nobody was allowed very near to the cart: there had been attempts at rescuing prisoners before, so the City Marshall who was present ensured that the cart was surrounded by armed guards on horseback. The route was from east to west, along Holborn, St Giles, and the Tyburn Road (now called Oxford Street). The gallows were near to the place we now know as Marble Arch. The cart stumbled across the cobbled roads. For the prisoners this was the first time in weeks they had heard the sounds and smelt what passed for 'fresh air' in the city. It was, however, far better than the sounds and smells of the rancid, overcrowded prison. 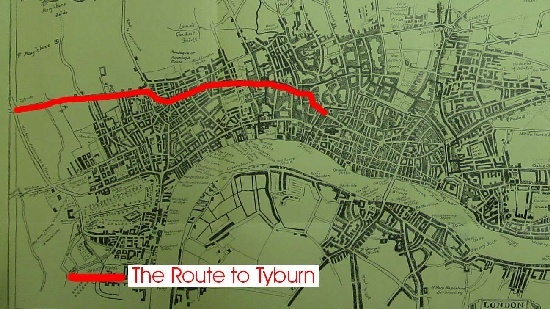 Even in the eighteenth century the Tyburn Road or Oxford Street was a lively area, with salesmen and shoppers and people stopping for a bite to eat or for a drink. Those who found a seat in the Mason's Arms, a pub in Seymour Place, would get a special view of the prisoners, because this was their very last place to stop for food and drink. Before that they would have had a drink half way through the journey, at the Bowl Inn at St Giles. The City Marshall knew that the utmost care had to be taken at this final stop. It was a custom for prisoners to have a drink - perhaps the alcohol would numb them before the execution. But the cellars of the pub still have the manacles on the walls, which show that prisoners enjoyed their last pint in unusual conditions. As they left the pub and were loaded back onto the cart, prisoners would shout to customers 'I'll buy you a pint on the way back!' We might think it strange for people condemned to death to be cracking jokes, but it was just one of the many rituals that made the day such a spectacle for the thousands who, at some point, decided to watch. Some, who might have come miles to see 'the drop', were determined to have a good time - almost as though it was a holiday or they had gone to a carnival - and it was Saint Monday, a long weekend, after all! There were eight of these hanging days a year and they were considered to be the biggest tourist attraction of the day! The journey from the pub to the gallows was a short one. The cart made its way through immense crowds, even more so than before. The three mile journey had already taken three hours. Amongst the crowd hawkers were selling food, and there was noise, bustle, and probably pickpockets. Women were selling copies of the prisoners' 'last dying speeches'. There was a gallery, rather like a present day football stand, full of people who had paid to get a view of the afternoon's main event - the hangings. Those who wanted the best seats booked a place in 'Mother Proctor's pews'. From here you could hear the prisoners' last speeches and their cries and screams as they 'croaked'. Three bars on three posts made up the three-cornered gallows: Tyburn 'tree' was known throughout the land. Anatomists nearby were looking closely at the condemned men - for mostly they were men - thinking about which ones would be best for dissection later. 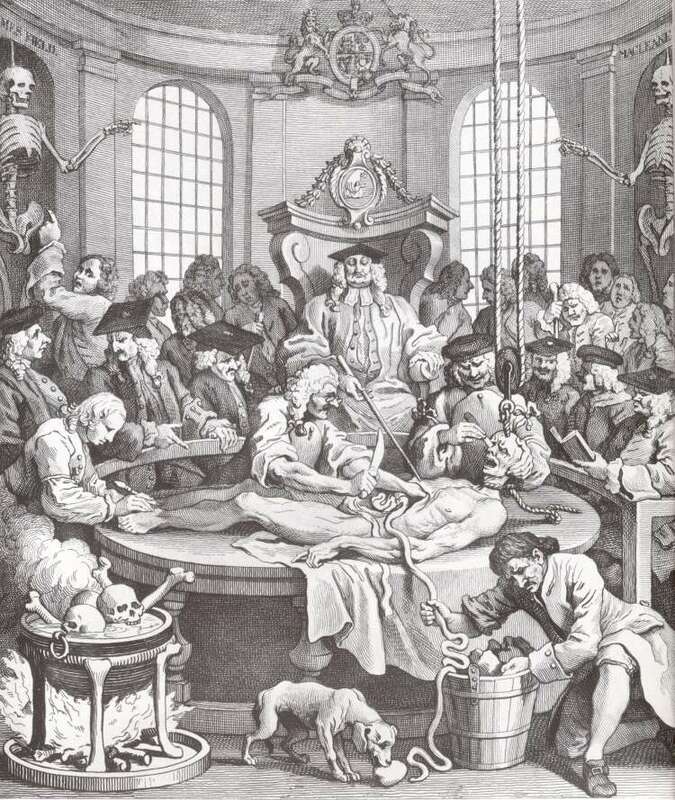 (In those days, people did not willingly leave their bodies to medical science as they do now.) But for many prisoners and their families, dissection after the hanging was another thing to fear. Indeed, big fights sometimes took place as the anatomists struggled with friends and family of the deceased for possession of the dead body. They wanted to bury the body, because they believed that only an intact body could lead to 'resurrection' and a life after death. The speeches were made. The men, some dressed in white wedding suits, looked a strange sight. Some gestured defiantly at the crowd. Some of the money from the 'Ordinary's Account', which contained their dying confessions and speeches, would go towards keeping their family - though how much of that actually got to them is anyone's guess. It is unlikely that many people would have been able to hear them; sometimes crowds of over thirty thousand were heckling and mocking the men. It is difficult for us to know now whether the sight of seeing people hanged acted as a deterrent to them committing crime or whether people's feelings about life and death were very different to ours. They were far more used to death. After all, in those days most children (about eighty percent) died before they even saw their fifth birthday. The prisoners, who were finally blindfolded, sometimes had a hood put over their head and had their arms tied behind their backs before they were strung up. It must have been a skilled job knowing how to tie the ropes around the necks of prisoners who struggled. In fact, the crowd cheered more for those prisoners who put up a fight, even as they were dangling and swinging. In the end, there could be twenty people on the 'fatal tree'. The Ordinary stood nearby, still preaching for their souls. It could be a slow death. Men could swing and struggle and gasp for air for up to three quarters of an hour. If they were lucky, then soon after the cart was pulled away and they were left hanging, a relative or friend would pull on their legs and put them out of their misery quickly. The give-away sign of death was when urine ran down the leg of the dead body. At this point, the crowds were hushed. 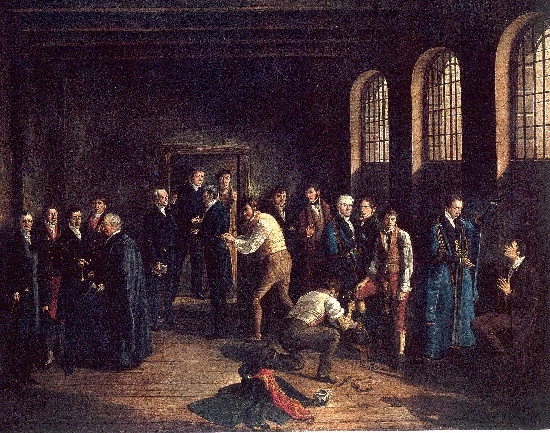 As the bodies were cut down one by one and the crowds started to walk home, some relatives thought of rescuing their dead from the fate of dissection by the anatomists. Others were desperate to touch the dead men's hands - they believed it would give them luck or perhaps a cure. However, it was mostly the City Marshall and the anatomists who won the fight for the bodies. The dead bodies were taken back to Newgate, still under security: even after death they were still prisoners. Executions took place at Tyburn between 1571 and 1783. 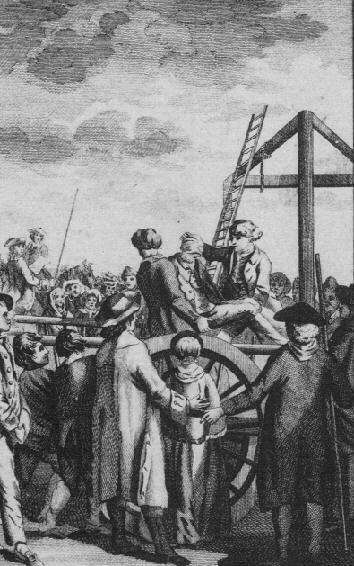 About 1100 men and almost 100 women were hanged at Tyburn in the eighteenth century. Londoners were also executed at Smithfield and Tower Hill. After 1783, because the government's fears of public disorder and rioting were so great, executions took place at Newgate, where security was easier to manage. Even then they remained a spectacle available to Londoners, with some paying up to £10 for a seat at one of the windows overlooking the gallows. The last public executions in London were in 1868.